Basic model configured by condensing a great variety of measurement functions into a compact and simple-to-operate design. 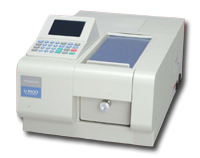 Spectrophotometer U-1900 answering a broad range of measurement needs. Measured data excellent in accuracy and reliability is assured by stable basic performance. The UV Solutions program enables a PC to control the U-1900.When this program is installed, the following programs are usable. Capable of performing color calculation and color difference calculation. Usable for checking extraction and refinement of nucleic acids such as DNA/RNA essential for genetic research. Data (photometric values at 230, 260 and 280nm), and calculation results (260/280, nucleic acid concentration, protein concentration, molar concentration) can be displayed collectively on the screen. The burden of optical instrument performance check can be alleviated. Item-dependent measurement mode and automatic measurement mode (when no sample is necessary) have also been prepared. In addition, a judgment tolerance range is settable so as to meet each analytical purpose. Developed to enable freely customizing the report output format of measurement results. Each character size and position of report items and comment are settable and besides, mathematical calculations conventionally dependent on manual method can be executed by spreadsheet program functions. Provides support for automation of measurement, data processing and printout. of spectrophotometer control, measurement result indication and judgment, etc. Because analytical procedure can be automated, it is possible to save labor and form working patterns. This is effective for routine work such as quality control. 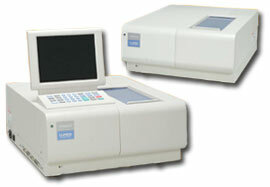 Spectrophotometer simpler to use an higher in dependability thanks to mounting of a large-size color LCD. High resolution satisfying European Pharmacopoeia (spectral bandpass: 1.5nm). Trace-amount measurement in biotechnological field, etc. can be carried out using optional 50, 25 and 5micro cells. 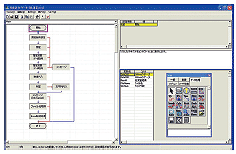 Measuring procedure can be readily programmed using a graphical editor for implementation of spectrophotometer control, measurement result indication and judgment, etc. Because analytical procedure can be automated, it is possible to save labor and form working patterns. This is effective for routine work such as quality control. Covers a wide variety of analysis needs from liquid samples to solid samples. Line-up of two types that can be selected in accordance with the measuring object and application. For use in a wide range of fields that focus on water quality, the environment, biotechnology, pharmaceuticals, materials, etc. This product is a PC controlled system. When installing this enhanced sample compartment and additional accessories in U-3900/3900H UV-VIS spectrophotometer, you can measure the reflection characteristic, polarization property caused by incidence angle and transmission of solid sample and optical component, like reflected plate. To use 5�/45�specular reflection accessory and 10mm rectangular cell, these accessories have to be purchased separately.